I can’t wait! I am finally going to take my daughter to see the much anticipated Cinderella movie this weekend. Not sure which of us is more excited! (Yes, I am a princess, ahem, KID at heart). Cinderella parties are already popping up all over the place and we are getting a lot of requests over here for those glass slipper wands. You can hop on over to the shop to see them here. Filed Under: Uncategorized Tagged With: Cinderella, cinderella party, cinderella wand cinderella movie, disney party, disney princess, glass slipper, Princess party, princess wand. 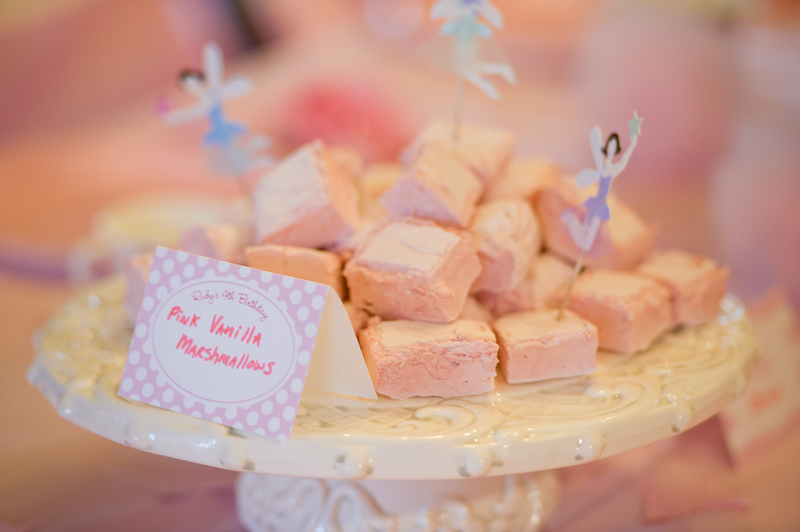 There were pink butterfly cookies, pink marshmallows, and pink popcorn. 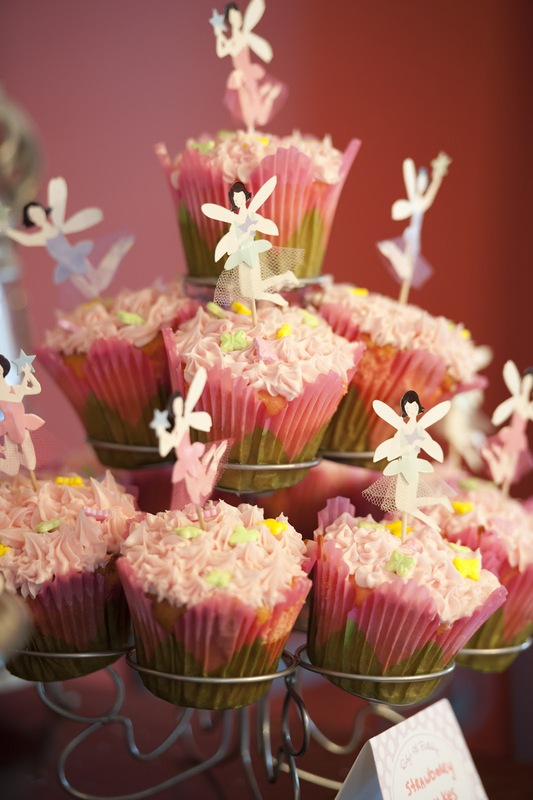 Strawberry cupcakes with pink icing and a pink toad stool cake. Even the veggie dip was pink! The girls filtered in one by one taking in the magical scene, totally in awe their surroundings. 1st order of business was to fairify them. (Yes, that is a word… in MY world, anyway!) 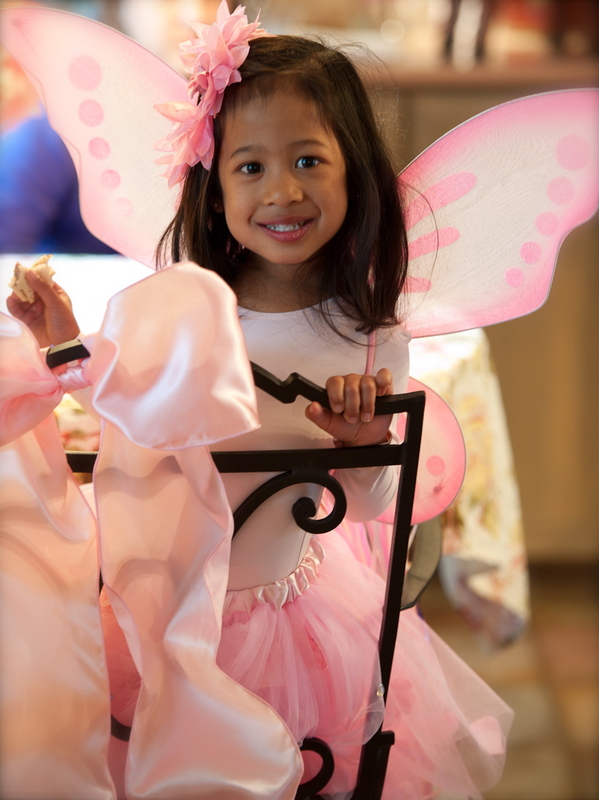 Each girl received a pink tutu, wings, and fairy halo. It was so cute to see the transformation from street clothes to fairy. You could tell they all felt special. And they were. It was precious watching all the girls get dressed up. I had a pretend make-up station, faux jewelry and a large mirror in the play room. Adorable little Brie has a tough time decided which necklace to wear! Next up, was the making of fairy wands. I picked up wooden star wands at ACMoore and painted them in pastel colors. I put them out for the party with glitter glue, paint brushes and lots of gems. They were a big hit! My daughter still plays with hers, a year later! 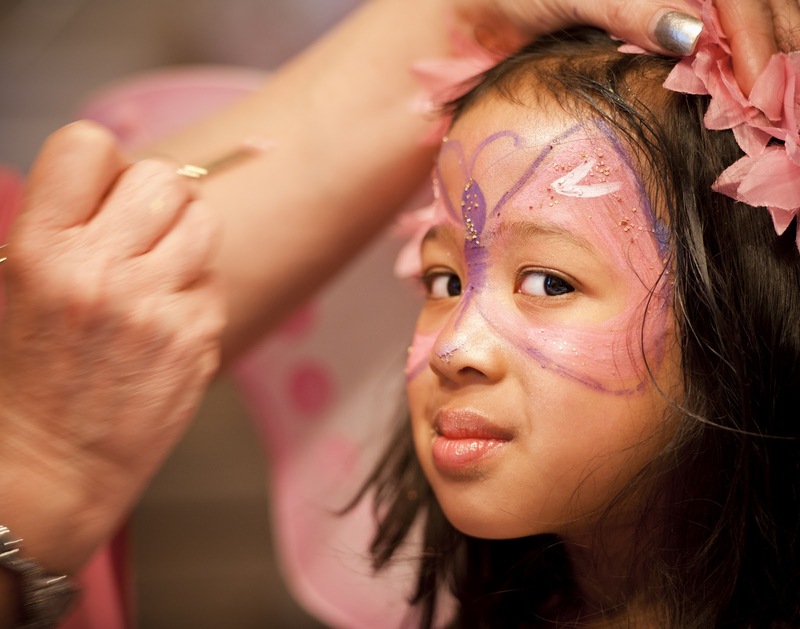 A make-up artist was on hand for face painting. Each girl chose the same thing- a pink butterfly. Sweet. This face melts my heart. 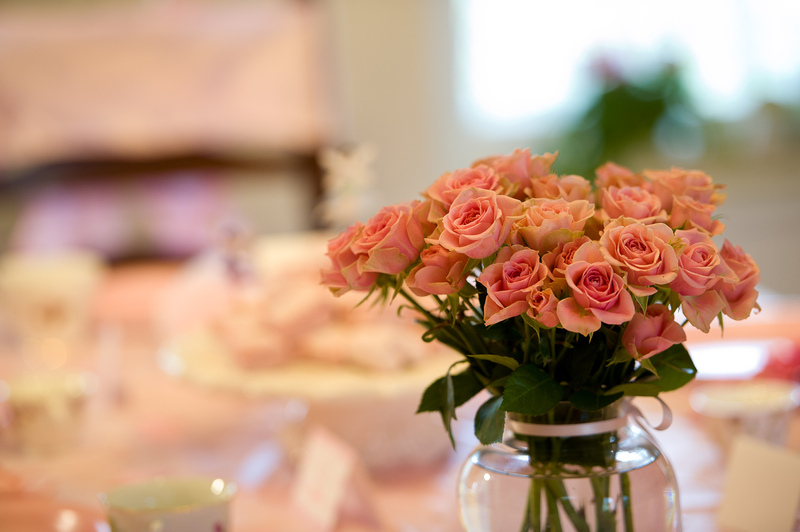 Had to have pink roses for the table! 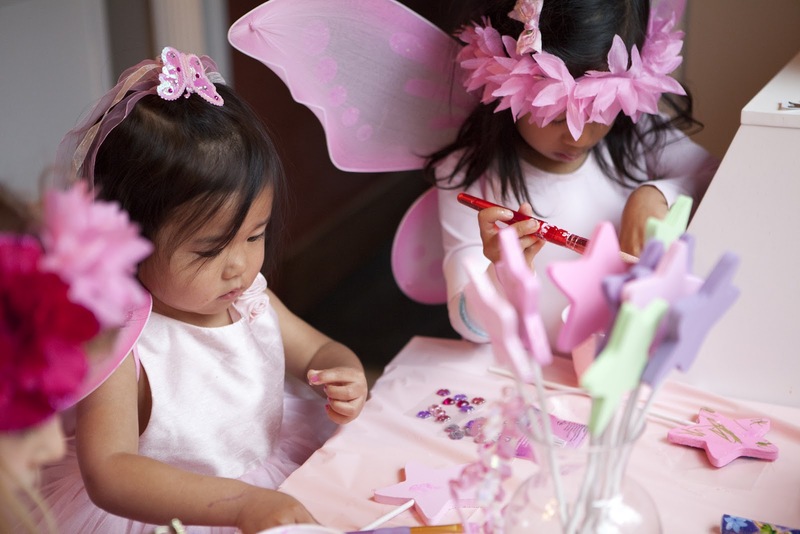 After face painting, they headed to the table for a royal fairy princess tea. 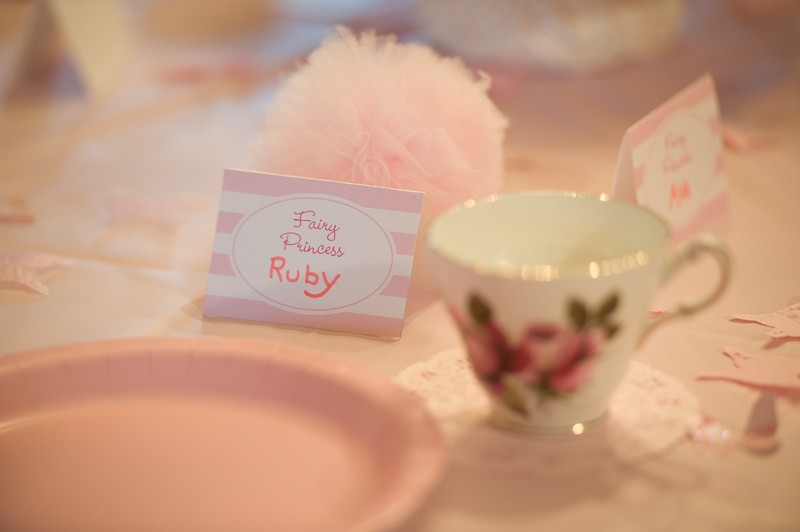 The little princesses drank pink tea or pink lemonade served in real porcelain tea cups. They nibbled on flower & butterfly shaped fruit kabobs and two kinds of tea sandwiches, along with yummy pink confections from the sweet table. Home made marshmallows are so much more yummy than the store bought kind! I got the recipe here. Pretty place cards from Chickabug. Ok, it’s not perfect, but I was very proud of this toad stool cake! My little girl loved it, too, and that’s all that mattered. The cutest water bottle labels every from Chickabug. Sweet party guest, Ava. I just love this shot. 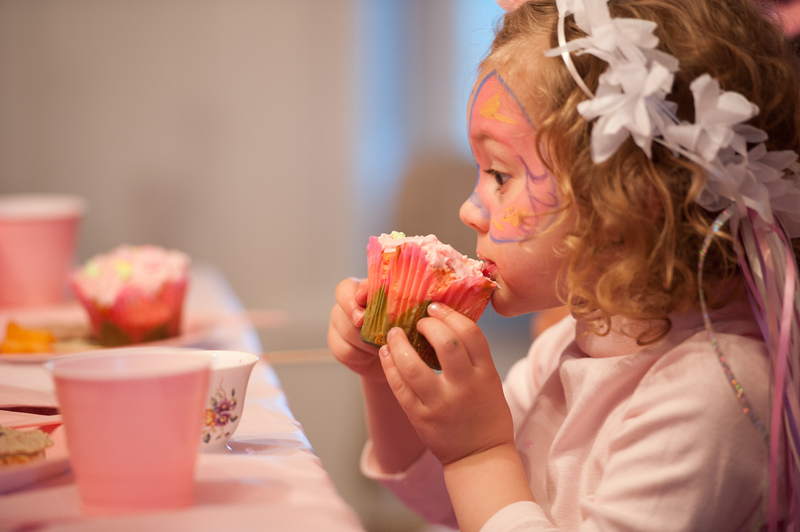 Another close friend, Brie, enjoys a cupcake. A sweet shot of another “guest” perfectly captured by awesome photographer, Sarah Zimmerman. Carefully placing candles in toadstool cake (and praying it wouldn’t collapse). It didn’t! 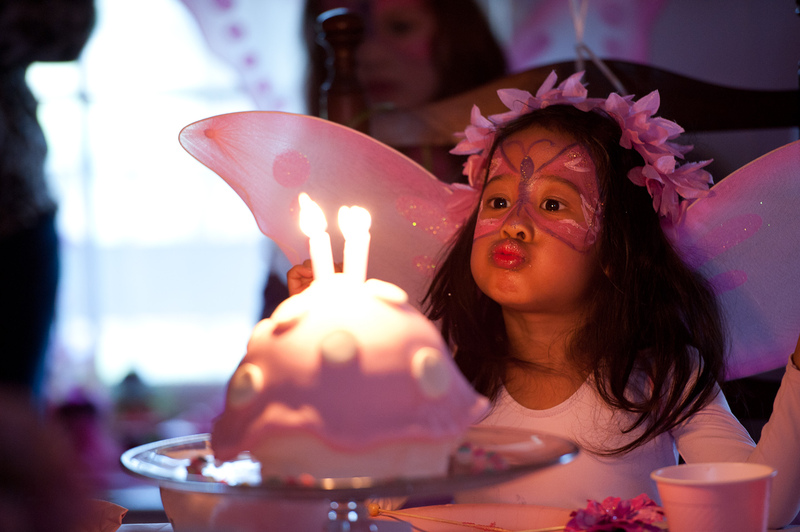 What every birthday party is all about: seeing your child’s face light with a big, happy smile. After lunch and sweets were served, there was a winged horse pinata’, song and dance, and games to play. And magic. Lots of it. Pretty, pink, sparkly magic. A beautiful day for a beautiful Fairy Princess. A very happy day for our family, celebrating our very sweet little 4 year old! 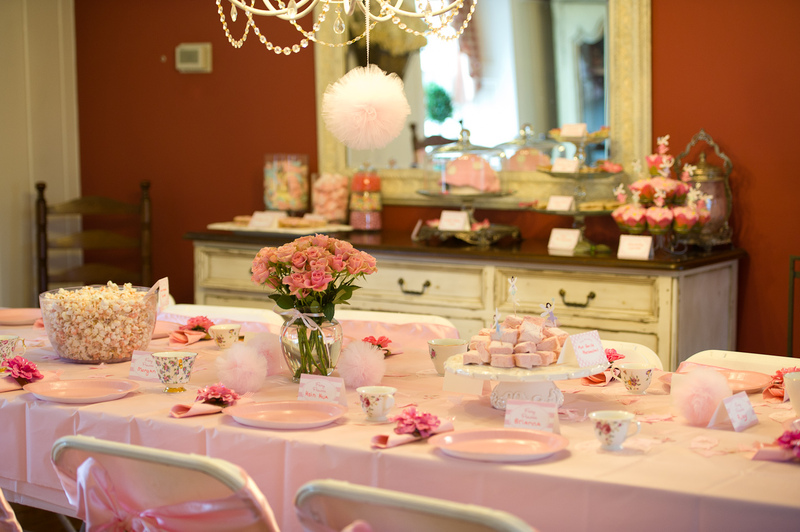 *THIS PARTY WAS FEATURED ON THE CHICKABUG PARTY BLOG in Sept, 2011. New Princess Wands With A Vintage Flair! 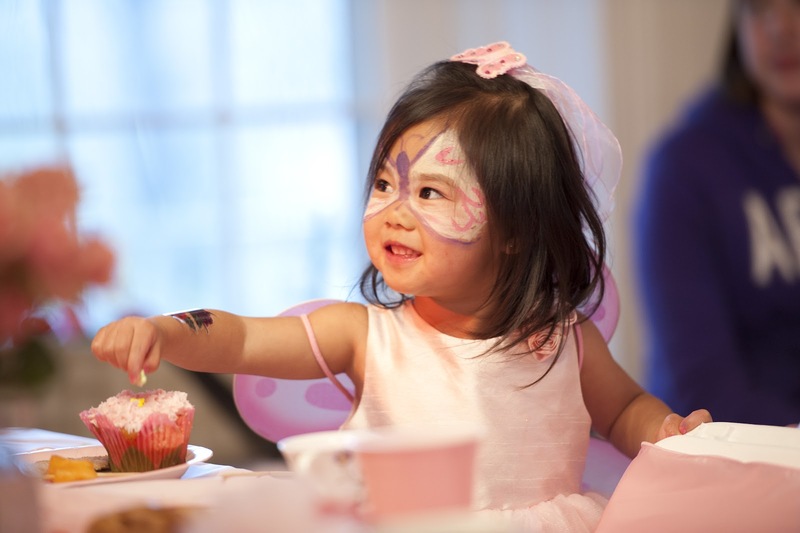 Who doesn’t love a PRINCESS PARTY? I made this new collection for a customer that requested a vintagey pink, cream, and white combo. While I love the way the wands turned out, it’s the lace tutu that I fell in love with the most! Wishing you a pretti day filled with lovely little things! Jack’s Blazin’ Fire Fighter Party!